The ukelele is a small instrument related to the lute that is popular in regions like Hawaii. Its size makes it perfect for traveling or use by small, young players as an introductory instrument to the guitar. Tuners help you make sure that each string of the ukelele is tuned properly, but you don't need to use a tuner specifically for ukeleles. You can use a guitar tuner. Ideally the tuner should be a chromatic one (i.e., it registers or plays all half steps), but a regular standard tuner works too. Look at the strings on the ukelele and figure out which string connects to each peg. If you are holding the ukelele properly (neck to the left), the right top peg connects to the G string (the thickest string; the one nearest the ceiling). The left top peg connects to the C string (the second one from the ceiling). The bottom left peg connects to the E string (the one third from the ceiling), while the bottom right peg connects to the A string (the one farthest from the ceiling). Turn on your guitar tuner. If your tuner plays pitches, set it to play G.
Pluck the G string. Turn your G peg to the left or right to adjust the pitch up or down; which direction raises or lowers the pitch will depend on how the strings have been strung on the pegs (over or under). 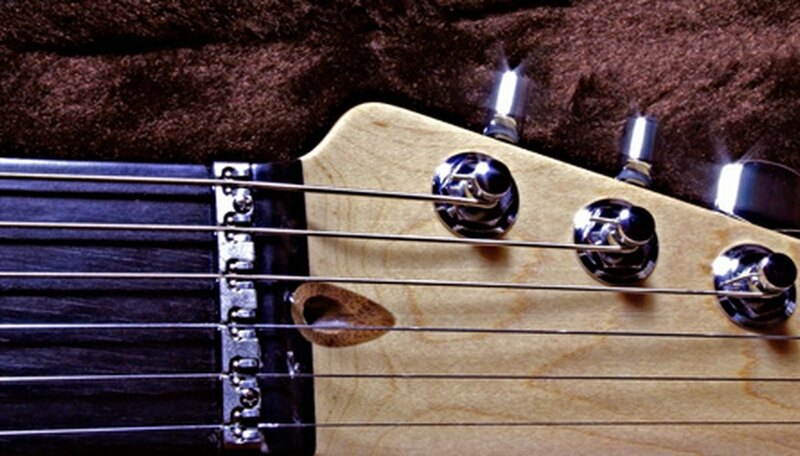 Move the peg and pluck the string until the pitch of the G string exactly matches the G note your tuner plays, or until your tuner registers the pitch you play as a G with no cents flat or sharp. Cents are the units of measurement used to determine how out of tune something is. If you are in tune, the tuning pitch indicator on your tuner should point straight up to 0 cents, or your tuner will have a little light that comes on. If you are flat, the indicator will point left to negative cent numbers. If you are sharp, the indicator will point to the right to positive cent numbers. Reset the pitch played by your tuner to the next string, if applicable. Repeat Step 4 for the C, E and A strings. Tune your ukelele's E string to the high E on your guitar tuner using the method in Section 1. Press your E string at the fourth fret and adjust the A string until the pitches of the two strings match. Press your C string at the fourth fret and adjust the pitch to match your E string. Press the G string at the second fret and adjust the pitch to match your A string. The Uke School website explains that when you lower "down" into pitches, it takes a few twists before the tension between the nut and peg becomes equal to the tension on the neck. For this reason, it recommends that you always tune "up" into pitches.